34-year-old Eric Molina becomes Anthony Joshua’s 18th straight KO victim which will now see the Briton finally take on Wladimir Klitschko in April of next year. It seemed the American challenger had no chance against the highly-effective shots thrown by 27-year-old Anthony Joshua at a packed Manchester Arena last Saturday night. Prior to the bout, the 2012 Olympic gold medallist knocked out all 17 of his opponents up until that point, so it’s no surprise the victory over Molina ended in the same fashion. Joshua appeared dominant from the very start and it only took three rounds for him to find a powerful right cross that landed straight on Molina’s chin. The referee quickly interfered and declared it an 18th straight victory for the Watford native. In fact, BBC Sport’s boxing expert Richie Woodhall believes the fight should have ended even sooner, considering the bombardment of punches that Joshua was throwing at his challenger. 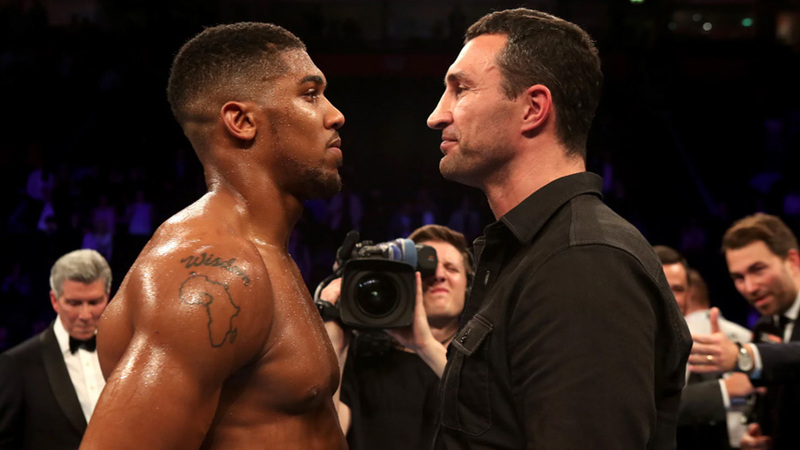 Following his victory over Molina last weekend, Joshua’s next opponent is set to be none other than Wladimir Klitschko – the pair have been pictured together as sparring partners on previous occasions, however on April 29 next year, the two fighters will go into a real clinch. The Briton and the Ukrainian were slated for a match this month, however Klitschko had to pull out from the fight due to injury, so Molina stepped in the ring as a replacement. Klitschko is gearing up to face Joshua in what is to be a ‘signature fight’ of the Ukrainian’s career. Despite turning 40 years of age this year, Klitschko has not given any indication about the possibility of hanging up his gloves, but has highlighted the upcoming bout against Joshua will be the staple fight of his career. “My hall of fame coach Emmanuel Stewart said, ‘one day you will have a signature fight.’ This is the fight he was talking about. It is something outstanding,” commented the Ukrainian. Klitschko maintains a record of 64 victories and 4 losses from 68 total fights, in a career that started two decades ago, right after he clinched an Olympic gold in Atlanta 1996. His latest bout against Tyson Fury – in November 2015 – saw Dr. Steelhammer succumb to a defeat after 12 rounds. This was his first loss in over 10 years, with Lamon Brewster being the man that inflicted Klitschko with only his third loss back in 2004. After the Tyson Fury fight, questions immediately started to emerge whether Klitschko has lost his edge in the boxing world and could he keep up with the fresh blood in the sport. Comparing his stats to that of Joshua – who has a scary record of 18 KOs in as many fights – it’s easy to see why boxing commentators believe it’s time for the Dr. Steelhammer to call it a day after the highly anticipated bout. Bet on boxing events with William Hill Sports!